The water business is about keeping things running smoothly, preparing for the inevitable and planning for the future. Pipeline breaks, power failures and hurricane threats are just part of the business. But when Don Roach looks back over more than 40 years in the water business one duty sticks out as the most frustrating he faced – seven Olympic-size swimming pools clogged of sand. He was doing a stint as water and wastewater utility manager for the Riyadh King Khalid International Airport in Saudi Arabia. He was responsible for the swimming pools and with every sand storm the pools had to be drained so the sand could be shoveled out. 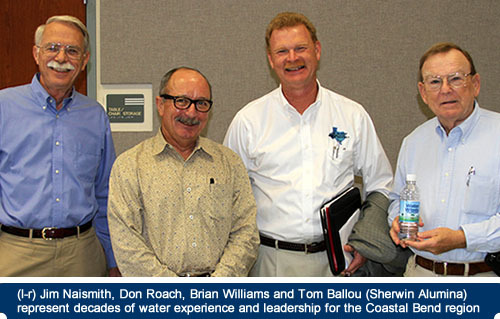 Roach retired at the end of November after 20 years as assistant general manager of the San Patricio Municipal Water District. Friends and associates gathered December 1st to honor Don for his leadership. Roach grew up in Kirbyville, deep in the forests of Southeast Texas. He started his career in 1968 at the Sabine River Authority then spent 20 years with the Trinity River Authority including time as the operations manager for regional water supply systems in Huntsville and Livingston. He went to Saudi Arabia in 1998 working for a subsidiary of Bechtel. There he was in charge of two reverse osmosis desalination plants, an ice plant and a central wastewater system. Roach spent 1993 working for Formosa Plastics Corp. in Point Comfort where he coordinated construction of a water treatment plant that supplies drinking water to Formosa and to residents of Point Comfort. 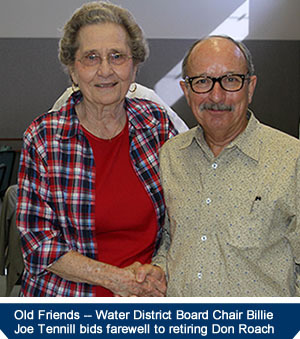 In 1994 he brought his sailboat to Ingleside and his years of experience to the San Patricio Municipal Water District. Jim Naismith, former Water District general manager, recalls that he did not have a job opening at the time but got some very firm suggestions from people in the water business who knew he should not let Roach’s experience get away. Naismith recalls that in the mid-1990s when it was time for the District to add significant new water treatment capacity it was Roach who made the strong case for taking a hard look at microfiltration. The result was the highly efficient Plant C put in service in 1999 with a capacity of 7.8 million gallons per day(MGD) and expanded several times since. It has a current capacity of 16 MGD and will be expanded again under a contract now in progress. Judy Hawley, chairman of the Port of Corpus Christi Authority Commission, and Mike Carrell, former port commission chairman, each made remarks celebrating Roach’s valuable service to the region. Hawley noted that port representatives regularly talk to new industrial prospects and that the first thing they ask about is water supply. “It is great to be able to send them to the Water District staff because even if the district does not have a ready answer they will always find one. 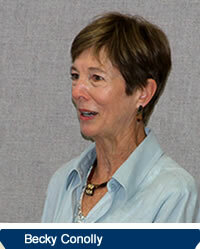 In recent years the go-to person was Don Roach,” she said. Carrell made the point that most of the new industrial expansion in the region is happening near the port’s La Quinta Channel in San Patricio County and is served by the district. He said that from the time he joined the port commission in 2002 he realized that the people in San Patricio County did things right and with exceptional professionalism particularly in the water supply arena. Roach’s studied planning for retirement started several years ago with the purchase of a tract of land on a bend in the San Antonio River west of Goliad, a property that once was the site of the town of Riverdale. He and partner Becky Conolly completed a new house on the property in 2012. In her remarks honoring her partner, Becky said that since Don had declared himself sheriff of Riverdale that she had assumed the duties of mayor. She recalled that the couple met online where it is always hard to size someone up or tell fact from fiction. What she really wanted to find out was what kind of people were Don’s friends and associates. Once she did the relationship flourished. Williams declared Roach to be a true renaissance man with a wide range of expertise and interests, making special note of his skill in training and leading the District’s staff over the years. Roach, in no mood for relaxing, said he is ready to get to work on some new retirement projects including the restoration of a recently acquired vintage sports car.